Corruption is one of the most difficult issues facing international arbitrators today. This publication addresses the issue of corruption in arbitration in a systematic way. It balances theoretical and practical considerations, takes into account the different perspectives of the parties, counsel and arbitral tribunal, distinguishing between commercial and investment arbitration. The topics covered include the impact of corruption on “gateway issues” of arbitrability, jurisdiction, admissibility, procedure and the arbitrator’s rights and duties to investigate and report corruption. It also addresses the most recent thinking and case law on the burden and standard of proof for allegations of corruption as well as the consequences and effects of allegations or positive findings of corruption on the dispute on the merits and the enforceability of the award respectively. The book identifies advantages and disadvantages of prevailing practices and equips the reader with tools and techniques to meet the challenge of corruption head on. Introduction: Definitions and Scope of the Topic Domitille Baizeau. Introduction : Définitions et portée des enjeux Domitille Baizeau . Chapter 1 Yas Banifatemi The Impact of Corruption on “Gateway Issues” of Arbitrability, Jurisdiction, Admissibility and Procedural Issues. Chapter 2 Aloysius P. Llamzon On Corruption’s Peremptory Treatment in International Arbitration. Chapter 3 Hiroyuki Tezuka Corruption Issues in the Jurisdictional Phase of Investment Arbitrations. Chapter 4 Vladimir Kvhalei Standards of Proof for Allegations of Corruption in International Arbitration. Chapter 5 Andrea J. Menaker and Brody K. Greenwald Proving Corruption in International Arbitration. Chapter 6 Sébastien Besson Corruption and Arbitration. Chapter 7 Nassib G. Ziadé Addressing Allegations and Findings of Corruption. 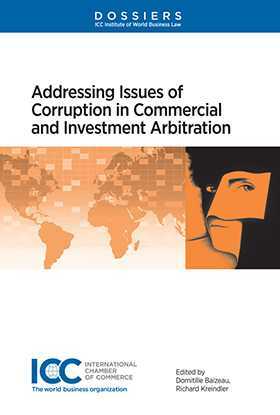 Chapter 8 Thomas K. Spangre Q C Corruption in Arbitration. Chapter 9 Edoardo Marcenaro Arbitrators’ Investigative and Reporting Rights and Duties on Corruption. Chapter 10 Matthew Gearing QC & Roanna Kwong The Common Law Consequences and Effects of Allegations or a Positive Finding of Corruption. Chapter 11 Juan Fernández-Armesto The Effects of a Positive Finding of Corruption. Chapter 12 Sophie Nappert Raising Corruption as a Defence in Investment Arbitration. Chapter 13 Carita Wallgren-Lindholm Consequences and Effects of Allegations or of a Positive Finding of Corruption. Concluding Remarks: Corruption and International Arbitration Richard Kreindler. The ICC Institute of World Business Law.